system, which is based in part on the philosophy of yoga. Chakra is a Sanskrit word for “wheel.” It is believed the seven majors chakras are spinning vortexes of energy aligned along the spine, hence the name of the game “SevenGyre” (gyre means a circular or spiral motion). 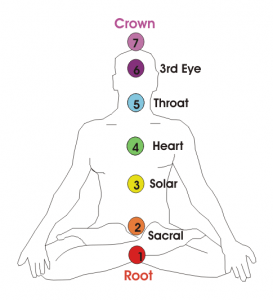 By memorizing the elements of the Chakras, the players can better integrate the system into his or her meditative practice. The game also helps the player enter the Alpha brainwave state known as “flow” both through the mechanics of gameplay and the binaural beats soundtrack to the game. There are believed to be many benefits to meditation that improve a practitioner’s overall wellness, including stress relief and pain management. For this prototype, I will focus on the second, or “Sacral” chakra. The purpose of this game is to clear your mind of “granthi“. The Sanskrit word granthi means “knot” or “doubt” and also means “an especially difficult knot to untie.” Granthi are psychological or psychic barriers to total freedomthat prevent prana (energy) from moving freely upward. As the player you will enter the game board, and clear the board of Granthi by collecting all the cubes. Do this by controlling the sphere using the arrow keys or WASD keys on your keyboard. Please read the following guided meditation, then when you are ready to begin, click the link below to play. You are about to embark on a journey of discovery inside your own mind. Allow your busy thoughts to rest as you focus on slow, steady breaths. Relax your belly and soften your mind. You are grounded and connected to the earth which supports you. Allow your mind to let go of outward thoughts and release the things you do not need to hold onto. Turn your attention inward as you breathe, letting the thoughts of the day drift away from you. Let go, feeling yourself here in this moment. Focus your attention on your breathing, pushing aside any tension or worry to make space for yourself in this moment. Pull your attention inside your mind and take a deep, relaxing breath as you prepare to begin your journey.